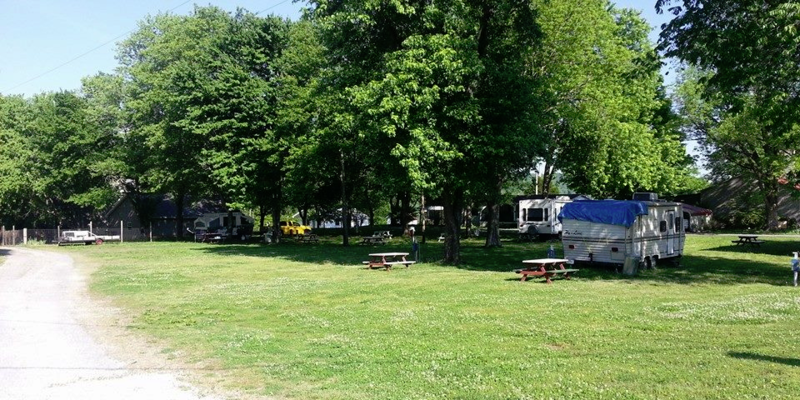 Made in the Shade RV Park is small and full of trees which appeal to us. Although the pool was closed since we were there in October, the pool appears to be of a good size well-maintained. The campground has a small lounge with a pool table which can also be used for table tennis. There is a large stone fireplace in there as well. There are two washers and dryers for camper use. For children there is a small swing set as well as tether ball, basketball and a volleyball net. The campground has a new owner, and it is obvious he is intent on restoring the campground facilities. The campground is very close to the town of Granville, and we walked into town most days. During the time we were camping, Granville celebrated their Fall Festival which was wonderful. Every Saturday night the town hosts the Sutton Ole Time Music hour as well as a family-style dinner. If we lived closer, we definitely would plan weekend camping trips at Made In The Shade regularly. We stayed in a full-service site with our two dogs for 8 days at the beginning of October. One alert: Made in the Shade welcomes hunters, so if that offends you, this might not be the place for you. On the other hand, the owner is very accommodating about assigning campsites.